Kate proposes a radial approach to implementing a regenerative, distributive economic alternative to the endless growth paradigm of Capitalism. How do we create a “steady state”, resilient economy that provides for the needs of all people while honoring the living environment? 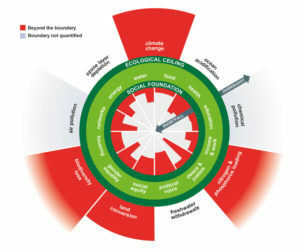 Here’s Kate Raworth’s ideas….